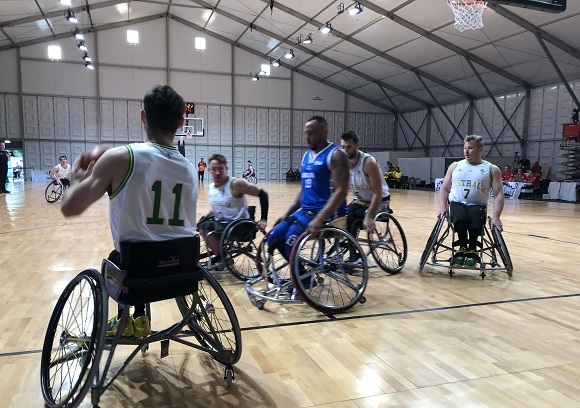 The Australian Rollers have succeeded against Brazil, 73-54, in the all-important crossover game to advance to the Quarter-Finals of the 2018 IWBF World Championships. While Australia controlled the contest for most of the night, they finally pulled away thanks to an 18-8 final quarter as they pushed out a nine-point advantage with an 11-1 run to start the fourth term. The Rollers locked down defensively, holding Brazil scoreless for the first two minutes and also restricting their opponents from knocking down a field goal for eight minutes as Brazil shot 1-9 for the period. Offensively, the Rollers were firing on all cylinders as well with clinical performances from Tom O'Neill-Thorne and Shaun Norris while Luke Pople (six points, one steal) clinched the victory with back-to-back three-pointers in an impressive shooting display. Brazil had started the game with a three of their own but the Rollers were on song early, setting up their defensive structures quickly and responding with the next eight points through O'Neill-Thorne (12 points, four assists, two steals) and Bill Latham. The Aussies hit six of their first eight shots as a team and the second unit was able to maintain the intensity to finish off the quarter, opening up a six-point buffer while all eight of Australia's field goals for the term were assisted. That hot shooting did not carry into the second period though as the Rollers went almost five minutes without a field goal. Captain Norris (eight points, five boards, eight assists) was able to break the drought and then Latham (20 points, five rebounds, five dimes) took over, connecting on a three-point play after nailing an impressive off-balance bank shot with contact. That sparked an 18-7 run to finish the half and it frustrated the Brazilians who gave up a couple of points from the charity stripe off technical fouls heading into the main break. Coming out of half-time with a renewed focus, Brazil looked to push the pace and beat the Rollers in transition but the Aussies stayed calm and were able to match any basket at their own offensive end to maintain a double-digit advantage. Tristan Knowles (eight points, seven assists) enjoyed some solid minutes, stringing together a couple of buckets himself and finding a cutting Kim Robins while Michael Auprince (six points, eight rebounds) controlled the glass to give the Rollers several second chance opportunities. That kept Australia in front by nine points and they looked in control before cruising home with a dominant fourth quarter as they tallied 27 assists on 31 field goals as a team. The Rollers are now expected to face Poland in the Quarter-Finals at 4.15am early Thursday morning Australian time. Stay tuned to Basketball Australia's social media channels for confirmation of game time.